How Is SE Asian Coffee Grown and Processed? Have you ever contemplated, while enjoying your favorite cup of coffee, just how those beans made it from the forest to your cup? The coffee growing and processing cycle is a fascinating process, and coffee enthusiasts will be interested to learn that Southeast Asian coffee growing has a few unique twists to it. Whether you’re thinking about becoming a coffee farmer yourself or are just intellectually curious about how your favorite beverage gets to you, here’s a basic step-by-step guide to the growing process and the SE Asian spin on the procedure when it comes to producing the world’s coffee beans. Coffee beans that are not made into coffee become seeds, which the coffee farmer plants in large coffee beds in the shade, watering them frequently. When they are ready, usually during the wet season, they are permanently planted in a location where they will become coffee trees. When these coffee trees mature, they bear red coffee cherries, which are picked off the trees either by hand or using a picking machine. Then the transformation of the cherries to the coffee beans that are brewed to make your coffee begins. In the dry method, the cherries are spread out to dry in the sun, with the processors raking and turning them throughout the day to prevent spoilage. This process can go on for weeks until they are at 11 percent moisture. In the wet method, processors take the pulp out of the coffee cherry, leaving just the bean and parchment skin, using a pulping machine. Once the beans are ready, they are separated by weight and put into fermentation tanks for 12 to 48 hours to get rid of the mucilage on the exterior of the beans. Once fermented, wet method beans must by dried to 11 percent moisture. 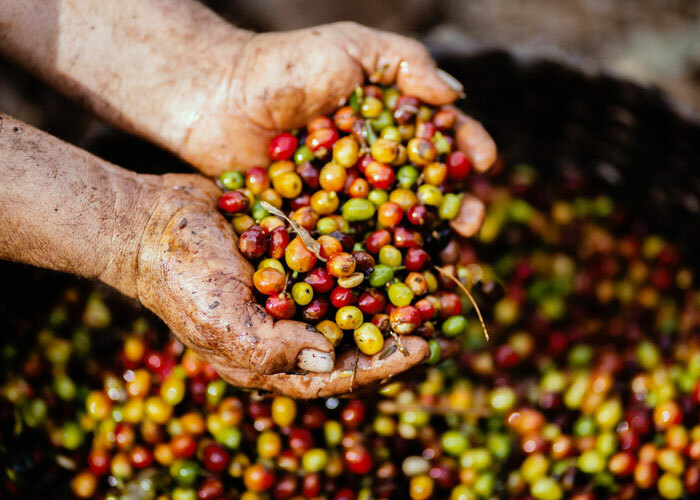 The beans now go through a hulling machine that removes what remains of the outer husk of the coffee cherry, and then a polishing machine that gets rid of any skin that remains. These polished beans, now looking much like the ones you get in the store, are graded and sorted and prepared for export, with defective beans removed prior to packaging. How Does Southeast Asian Coffee Processing Differ? SE Asia coffee is becoming increasingly popular for its unique look, smell, and flavor. Indonesia, including legendary coffee producing areas like Java and Sumatra, have a specific method of coffee processing. It is a wet method of processing, which they call Giling Basah. They remove the outer skin and leave them in the mucilage for 24 hours, then wash them and dry them, leaving in a bit more moisture, about 33 percent, before finishing the hulling and processing. SE Asia coffee processing in Thailand encompasses both the familiar Arabica coffee and Robusta bean coffee, more popular in SE Asia. Thai coffee farmers grow Robusta in the south and Arabica in the north, using both shade growing and open sun growing methods, as well as intercropping. Although most SE Asian countries use some form of the wet method of processing, the tastes of SE Asian coffees can differ widely depending upon the type of bean, the soil and the processing quirks of the individual farms. The only way to know for sure which ones you will like the best is to try as many as you can!